Plant is at the center of a big move to also solve city’s solid waste problem. The East Bay Municipal Utility District wastewater treatment plant, a formidable assembly of mixing tanks, pumps, and pipes on the city’s north side, has 11 megawatts of biogas-fueled electrical generating capacity, more than the plant’s power demand.Click image to enlarge. OAKLAND, Ca.–Although treating wastewater generally ranks alongside police and fire safety, schools, and transit as the top priorities of any sensible city hall, new ideas about cleaning up sewage almost never attract headlines or TV airtime. In its 90-year history, for instance, The New Yorker, the most urbane and expansive magazine in the country, has never published a feature article on sewage treatment. It has taken a four-year drought in California to change that. A 7-year-old treatment plant in Orange County that recycles wastewater to recharge drinking water aquifers – and generates most of its own energy – is attracting international attention for its design and effectiveness. City authorities in Modesto and Turlock are working with the Del Puerto Water District in Patterson to recycle wastewater from two municipal treatment plants to supply almond, fruit, and vegetable growers with 30,000 acre-feet of irrigation water annually, equal to a third of the water district’s annual demand. 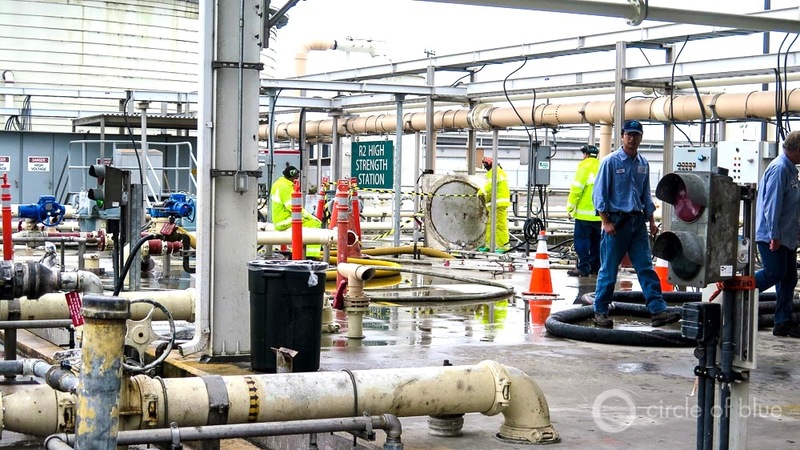 Here in Oakland, the 64-year-old regional wastewater treatment plant has elevated an essential urban service to a new level of innovation and civic importance. The East Bay Municipal Utility District (EBMUD) treatment plant, a formidable assembly of mixing tanks, pumps, and pipes on the city’s north side, has 11 megawatts of biogas-fueled electrical generating capacity, more than the plant’s power demand. The excess power is sold to the Port of Oakland, and EBMUD saves about $US 3 million in electric expenses a year. In 2006, Oakland adopted its Zero Waste Strategic Plan to reduce the city’s 363,000 metric tons of annual solid waste, much of it sent to landfills, to 36,000 metric tons by 2020. Twelve percent of the waste, according to city figures, was food waste from institutions, stores, restaurants, and homes. The EBMUD plant is converting a good portion of that food waste to energy.Click image to enlarge. According to Treatment Plant Operator, the industry’s premier trade magazine, the Oakland plant is the first in the nation to sell extra electricity produced entirely from waste back to the regular grid. Equally significant is that the plant’s gas-producing operations, generated from digesting sewage, food waste, and other biodegradable byproducts, occupy a central role in the city’s ambitious recycling program. Overall, the city wants to reduce solid waste production 90 percent by 2020. Dave Allen supervises the ERBMUD plant’s electrical power operations, including the 4.5-megawatt gas turbine installed three years ago. 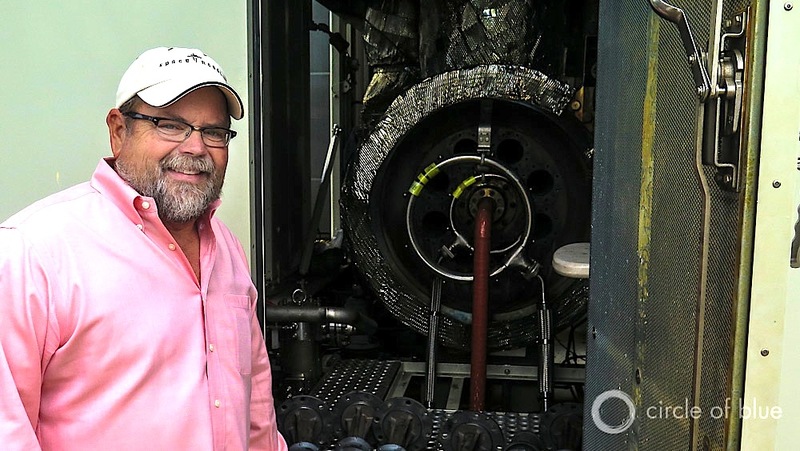 “What you see here in a plant built in the early 1950s is an evolution in how we look at sewage,” he said. “Wastewater really isn’t waste. It has important value that Oakland recognizes. It’s not just about cleaning up people’s poop.”Click image to enlarge. Three years ago Allen’s team installed a 4.5-megawatt gas turbine, adding to the three gas-fired generators that EBMUD has operated since 1985. The power plant generates up to 11 megawatts, depending on the capacity of the 12 digesters to convert waste to gas. Anything above the six megawatts needed to turn pumps and mixers and other water treatment equipment is excess power available for sale. The conversion of waste to energy has been so effective, said Allen, that the utility is steadily making big capital investments to improve efficiency and enlarge capacity. The most recent change in operations is collecting and processing more of the Oakland region’s oils, fats, grease, and other food wastes to convert to biogas. In 2006, Oakland adopted its Zero Waste Strategic Plan to reduce the city’s 363,000 metric tons of annual waste, much of it sent to landfills, to 36,000 metric tons by 2020. Twelve percent of the waste, according to city figures, was food waste from institutions, stores, restaurants, and homes. The city’s strategic plan essentially called for reducing the volume of solid waste through changes in packaging and purchasing habits, and recycling what’s left for useful purposes. Daniel Hamilton, Oakland’s sustainability program manager, said in an interview that the 2020 goal is within reach. One reason is that the treatment plant is upgrading its capacity to digest food waste and is aggressively marketing its waste-to-energy recycling program to food waste producers, including farms hundreds of miles away. 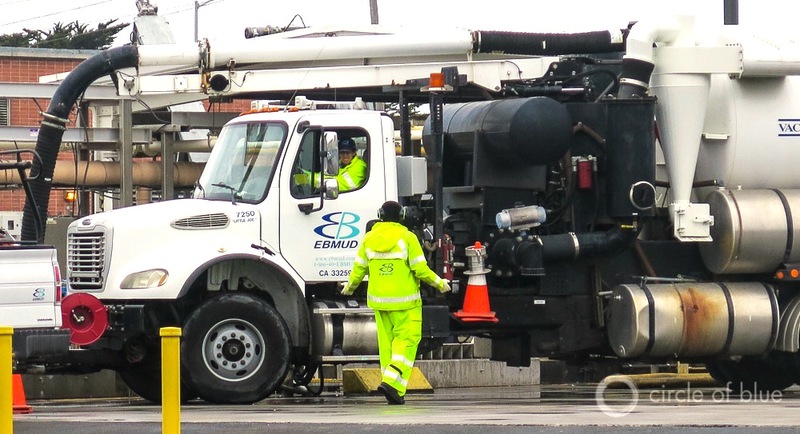 A steady stream of trucks growl to a stop and park with a hiss of their air brakes at the EBMUD plant’s waste handling station. Thick hoses snake across the facility to drop their cargo into holding tanks. Three to four weeks later, after passing through digesters stocked with hungry waste-converting bacteria, high-energy gas is combusted to produce power. Click image to enlarge. The EBMUD plant treats an average of 227,000 cubic meters (60 million gallons) of wastewater daily from 650,000 people and businesses in Oakland and eight surrounding cities. The drought and water use reduction programs have reduced the flow to the plant. One feature that has not grown quieter is the facility’s food-waste receiving station, the busiest section of the treatment plant by far. A steady stream of trucks growl to a stop and park with a hiss. Thick hoses snake across the facility to drop their cargo into holding tanks. Three to four weeks later, after passing through digesters stocked with hungry waste-converting bacteria, high-energy gas is combusted to produce power. As part of the Wilson Center and Circle of Blue’s Global Choke Point project, Choke Point: Port Cities will examine how Oakland, California, and Shenzhen, Guangdong Province, are responding to interlinked water, energy, and pollution challenges. These multimedia reports are meant to inform exchanges and convenings in 2016 to share among leaders of both cities and others like them around the Pacific Rim.